Miranda is a pre-teen living in New York City with her eccentric mum. Her best friend lives only a few apartments away from her, and her mom is auditioning for a reality TV show. Her life begins to unravel, when Sal (her best friend) gets hit by a street-side bully for no reason. Then her mom's spare key is stolen, and a rather mysterious note arrives. The note claims that the writer is coming to save the life of one of Miranda's friends. It asks Miranda to write a letter to the anonymous sender of the notes. The notes keep coming, and Miranda realises that the writer seems to be able to predict-accurately predict-the future. Each message leads her to believe that she can prevent a disaster. The last note however, makes her think she's too late to avert a tragic death. My favourite character in this novel is definitely Miranda's mom. It seems that she switches roles with her daughter often, choosing childish and colourful fashion, setting her financial hopes on a reality TV Show and eating a child's choice of meals. Her eccentric personality is one I haven't come across a lot in fictional adults- which really helped me engage with the other characters. I know that I've categorized this book as a Science-Fiction and that make some of you averse to the idea of picking up this book. Trust me when I say, this is a science fiction in the least of senses. It incorporates a tiny element of science fiction, which I do not want to ruin for you, but otherwise focuses mostly on Miranda and the unravelling of her life. The young students in this book get their first job, attempt to differentiate between social classes, stand up for themselves and create a better world for themselves. They get off to a rocky start, but the story that this creates is exceptional. In most respects this is a middle-grade novel that deals with the loss of a friend, the rekindling of the friendship, the creation of new friendships and the understanding of how friendships work. 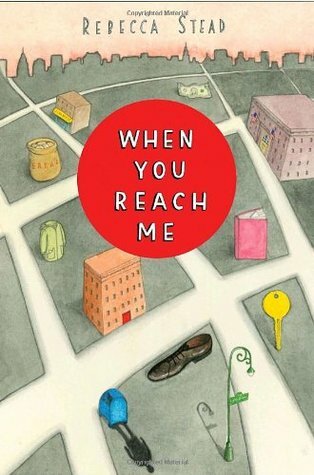 I used the words "friend" and "friendship" various times in that sentence, I know- but "When You Reach Me" is really a book that aside from all the flourishes (required flourishes) is a book that relates to anyone who's had ruined friendship. Great review :) I read this book a while ago, but I remember loving it. It was also very tragic, if I remember correctly? I wouldn't say it was tragic-but there were certainly some very melancholy parts! Sounds like a really good middle grade book, and who among us has not had a ruined friendship, so tapping into a common issue. Exactly- books that tap into common issues often find the best audiences possible- those that care! I'm so glad you liked this one! I really enjoyed it...but then again, A Wrinkle in Time was my favorite book as a child, and - as you know - this novel relies heavily on that one. I never read a Wrinkle In Time- but I have friends who rave about it!